When it comes to staying on track in your fitness regimen, it’s important to eat the right foods for protein and energy. Don’t let Game Day deter your exercise goals. Instead, keep your eye on the prize with healthy, easy eating options that have a short cooking time. Below, BPI Brand Ambassador, Christina Sullivan shares one of her favorite recipes for cheesy quesadillas that are quick to make right in time for Sunday night football. Heat a stir-fry pan on a high setting on the stove and add a small amount of olive oil. Add 20 oz. of Jenni-O Extra Lean Ground Turkey Breast to the stir-fry pan and allow it to cook. Stir the meat in the stir-fry pan. While the meat is browning, evenly pepper it with Badia Taco Seasoning. Stir the meat, and add 1 tbsp. of McCormick Gourmet Paprika Seasoning and Badia Cumin Seasoning. Remove the meat from the stir-fry pan and place it in a bowl. Clean your stir-fry pan, place it on the stove and heat it on a medium setting. Add your vegetable medley that includes yellow, orange, red, and green peppers along with onions to the stir-fry pan. Add 2 tbsp. of Badia Taco Seasoning and Himalayan Pink Salt to your vegetable medley. Spread Laughing Cow Cheese Creamy Queso Fresco Chipotle on two La Banderita Carb Counter Low Carb Tortillas. Spray cooking oil evenly inside a quesadilla maker. Place one tortilla inside the quesadilla maker with the cheese-smeared side facing up. Top the tortilla with ground turkey breast meat, vegetables, shredded cheese, and taco seasoning. Add the other tortilla (with cheese-smeared on top) over your vegetable and meat filling. Close the quesadilla maker and heat it for five minutes. 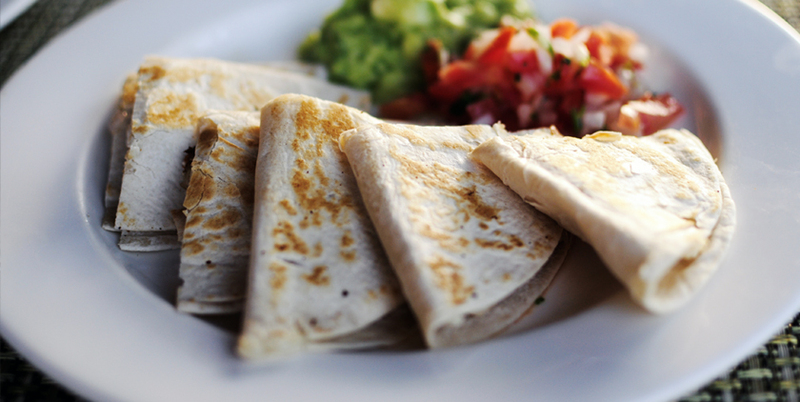 When finished, remove the quesadilla from the device and cut it into triangles. Add a dollop of taco sauce to each triangle. Serve with a salad of cucumbers, jicama, lime and a sprinkle of Trader Joe’s Chili Lime Seasoning for a healthy meal. Enjoy!